At GreenThumb Shropshire & Wolverhampton our team consists of 17 staff, including 10 professionally qualified Lawn Advisors. We treat over 14,000 lawns each year, with each customer generally receiving at least four seasonal lawn treatments annually. As the lawn treatment company of choice in the area, we combine high quality exclusive products, with a knowledgeable, efficient, reliable and friendly service. You can have a lush, green, weed-free lawn. I have been using the GreenThumb company based in Market Drayton for several years now and am more than happy with their service. They keep my three lawns weed and moss free so all I have to do is mow them. Hi Brian, thank you for your review. Any tips or advice don’t hesitate to contact us. My front lawn, north side of the house, deteriorated badly in winter and did not meet GreenThumb's exacting standards. Therefore in the autumn they stripped off the 'old' lawn and sowed a new lawn for me all at their own cost! Brilliant service! Thank you John for taking the time to post a review. Have been using GreenThumb for several years and have always been satisfied with the excellent service provided - polite, professional and friendly. Hi Julie, great to hear that your satisfied with our service, but should you require any advise please don’t hesitate to contact us. GreenThumb has been looking after our lawns for 5 years plus. Always prompt with treatment, advice and excellent service from GreenThumb staff. We would recommend GreenThumb as a trusted trader. Hi Anna, Great to hear you are pleased with our service and thank you for taking the time to post a review. Please remember if you need any advice just give us a call. 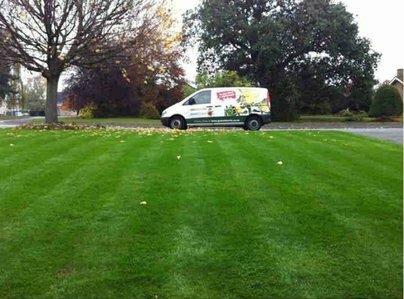 We have been with green thumb for many years our lawns are lush, green and weed free at a cost-effective price. Any problems and green thumb are quick to send an advisor to diagnose and treat the problem. The job is always done with efficient and courteous service. I have used Greenthumb for more than 10 years, my lawn always looked poor no matter what I did, Greenthumb reversed that trend and I now have the best lawn in the street, 4 visits, 4 treatments a year is all I need, it stays lush even in hot weather and grows across the whole lawn season. Don't waste your time doing it yourself, our neighbours have tried for years sadly for them failed miserably. Prompt service - always turned up on the date stated. The staff who came to my house are pleasant and courteous and always come on the pre-notified date. They work quickly and efficiently.